The sheltered Gazzle coastline hosts an abundance of wildlife, we’ve found 80 different species along our coasteering routes! Newquay Activity Centre has teamed up with the Cornwall Wildlife Trust to offer you an ecology focussed coasteering adventure at low tide. 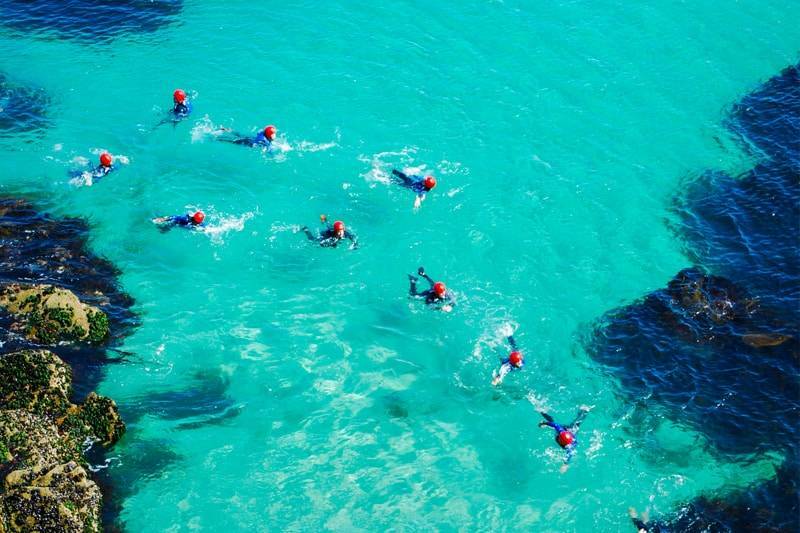 We are #1 on Trip Advisor and offer the best coasteering experiences in Newquay! Our unique Low Tide Coasteers combine exhilarating adventure with an environmental focus. The Gazzle is a special stretch of coastline that hosts an abundance of marine species. As the tide recedes the mystical deep reveals a completely new and adventurous route. You’ll climb through smugglers caves now home to friendly grey seals, traverse the rocky outcrops and glide through natural rapids onto new sections of the route. Low Tide Coasteering is the perfect way to get up close and personal with the flora and fauna along our coastlines. We provide wetsuits, buoyancy aids, helmets and hi-visibility rash vests from our centre. Your instructor will also take a collection of bin bags along so you can perform your very own mini beach clean and help us sustainably manage our coastline for the future. Once kitted out in our heated changing rooms you will be given a full safety briefing and comprehensive instruction about correct coasteering techniques. You will cover how to enter and exit the water, traverse the cliff lines and wild swim safely between sections, before heading down to Town Heads craggy rocks.